The researchers behind a new study published in the Journal of Experimental Medicine note that inhibiting an enzyme known as cyclin-dependent kinase 2 could potentially save the hearing of millions of people. Researchers suggest that the drug kenpaullone may help to prevent hearing loss. In the study, inhibiting cyclin-dependent kinase 2 (CDK2) was found to protect rodents from noise- and drug-related hearing loss by preventing the death of inner ear cells. If CDK2 inhibitors are proven to be an effective treatment for this purpose in humans, it would be very significant, as there are no medicines currently approved by the Food and Drug Administration (FDA) to treat hearing loss. It is thought that, worldwide, around 466 million people have “disabling hearing loss,” which can be caused by a variety of factors — including infection, birth defects, exposure to noise, and the use of some medicines. Last year, Medical News Today reported on a study that was published in the journal Menopausethat found an association between the use of hormone replacement therapies in women and a higher risk of hearing loss. However, this finding surprised the study authors, and they were unable to determine the causal mechanisms behind the association. The researchers examined the individual potential of more than 4,000 drugs to protect inner ear cells from the adverse effects of a chemotherapy drug called cisplatin, which is known to induce hearing loss in up to 70 percent of patients. Although cisplatin is effective against cancer, its associated side effect of hearing loss can be irreversible. 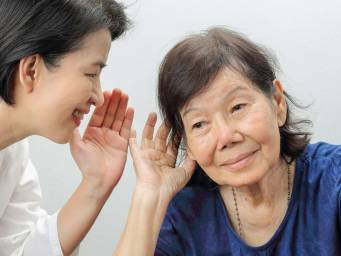 Researchers suggest that hearing impairment may be a driver of memory loss. Learn More About The Efficacy Of A Hepatitis C Treatment Option. Physician Site. The scientists found that injecting kenpaullone into the middle ear of mice and rats protected the animals from the hearing loss associated with cisplatin. In the study, kenpaullone seemed to stop CDK2 from initiating the production of “toxic reactive oxygen species” in the cells of the ear. Toxic reactive oxygen species are molecules and free radicals derived from molecular oxygen that are believed to cause a number of adverse effects to cells. The researchers believe that this is the mechanism by which kenpaullone protected the animals from cisplatin-related hearing loss. Another interesting finding reported in the study was that kenpaullone also protected mice from hearing loss caused by noise up to 100 decibels. Zuo and team believe that the protection conferred to the animals in the study by just one injection of kenpaullone was so powerful that CDK2 inhibitors might “transform the clinical prevention and treatment of cisplatin- and noise-induced hearing loss in patients” — especially if these existing drugs are further optimized specifically for this purpose. Previous post Could our blood reveal our future dementia risk? Next post What is a yeast allergy?